Photo by Dale Parker, AquaTax Consulting. 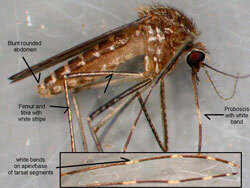 The Culex tarsalis mosquito is the primary vector of WNV to humans in the western US. Mosquitoes have long been considered a pest of concern in Wyoming but they have taken on new importance with the introduction of West Nile Virus (WNV) to the North American continent in 1999. This disease has seriously impacted human health across the US. In 2004, there were 88 deaths nationwide caused by WNV. Wyoming had 375 human cases with 9 resulting in death from WNV confirmed by the Center for Disease Control in 2003. In Wyoming, there were only 10 human cases in 2004. This decline may be attributed to many factors such as lower vector mosquito populations, successful mosquito bite prevention education, and mosquito control programs. WNV has also caused death and incapacitation to livestock with horses, mules, and donkeys being especially vulnerable to the disease. A preventative vaccine, developed for veterinary use only, has drastically reduced the death loss of horses due to WNV nationwide. Mosquito control programs in the past were mainly conducted to reduce the nuisance causing mosquito species. Many Wyoming towns had no mosquito control programs at all before the arrival of WNV. This has changed and perhaps it is for the best for as there are other insect borne diseases that could arrive in this country that would have even greater impacts on human health than WNV. If we, the people and governmental agencies can learn to effectively manage and mitigate WNV and its vector mosquito species we will be better prepared to fend off all other insect borne diseases in the future. What about WNV and dogs and cats?